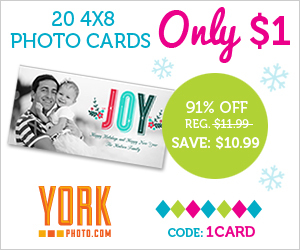 Home » Blog » Amazon Deal Blog » York Photo: 20 Holiday Photo Cards For $1 Plus $3 Ornaments! 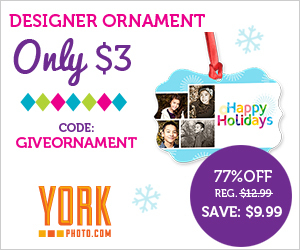 York Photo: 20 Holiday Photo Cards For $1 Plus $3 Ornaments! Create 20 custom 4×8 photo cards for only $1! To get your 20 4×8 photo cards simply enter code: 1CARD at checkout. You save $10.99! This offer is for NEW customers only. Shipping is $3.49. Offer expires November 30th 2013. Order your 20 4×8 custom photo cards! Looking for another fun photo idea? Customize a designer ornament for only $3! To get your $3 designer ornament simply use the code: GIVEORNAMENT at checkout. You save $12.99! This offer is available to NEW customers only. Shipping is $3.99. The would make a super fun Christmas gift! Order your $3 designer ornament!